Student-led interviews contribute to the college-wide, interdisciplinary oral history project and public archive. Sophomore Ben Cohn, right, interviews Vietnam veteran Michael O'Brien, '79, at the Brooklyn College radio station. Philip Napoli, a professor in the History Department, has devoted a good portion of his career to recording the oral histories of veterans. He is the director of the Brooklyn College Veteran’s Oral History Project, for which he has conducted interviews with hundreds of New York City’s Vietnam veterans. This year, Napoli asked two of his students to interview alumni veterans who served in the Vietnam War for inclusion in the Brooklyn College Listening Project, a college-wide, interdisciplinary oral history project that aims to create publicly accessible audio archives of the every day lives of Brooklyn residents. 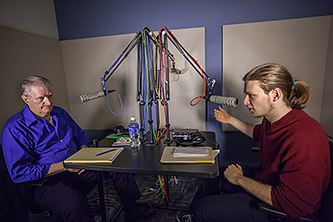 Benjamin Cohn, a sophomore and history major, and Kayleigh O’Kane, a junior communication major, sat down in the Brooklyn College radio station to record their conversations with U.S. Army veterans Michael O’Brien '79 of the Fourth Infantry Division and Anthony Wallace '75 of the First Cavalry Division. Both students logged more than two hours of recorded audio with the men, which Napoli has compiled into a 4-minute podcast. "Anthony Wallace has a very powerful story," says O’Kane, a student in one of Napoli’s pop culture courses. Wallace suffered a back injury from a blast after his bunker was hit, killing two other men who were with him. "It made the war more personal to me. I wasn’t born then, so the Vietnam War never seemed relevant to my life." O’Kane adds that, after this experience, she is adding radio broadcaster to the list of careers she is considering. Cohn is a Macaulay Honors College student who is taking Napoli’s course on Vietnam. He interviewed O'Brien as part of a class requirement for which he has to interview two veterans and write a paper comparing their experiences. One of the most striking parts of the conversation for Cohn, who is considering becoming a foreign correspondent, among other career choices that would allow him to explore the globe, was O'Brien's desire to serve—he volunteered for the draft—and his sense of patriotism. "It seems like he was among one of the last generations of people who wanted to defend America," says Cohn. "This guy felt it was a duty." For his part, Napoli—who has been compiling oral histories of veterans since graduate school, has written a book about the stories of some of the veterans he has met, and counts many veterans among his very good friends—says he’s glad to give the men who served an opportunity to "witness" their stories. "It’s therapeutic," he says, "and a way to make their memories useful." He hopes his students are learning, through their Listening Project experiences, "the power of emphatic listening." Last spring, 22 classes participated in the Listening Project, contributing raw material that will be housed in the library’s special collections archive.